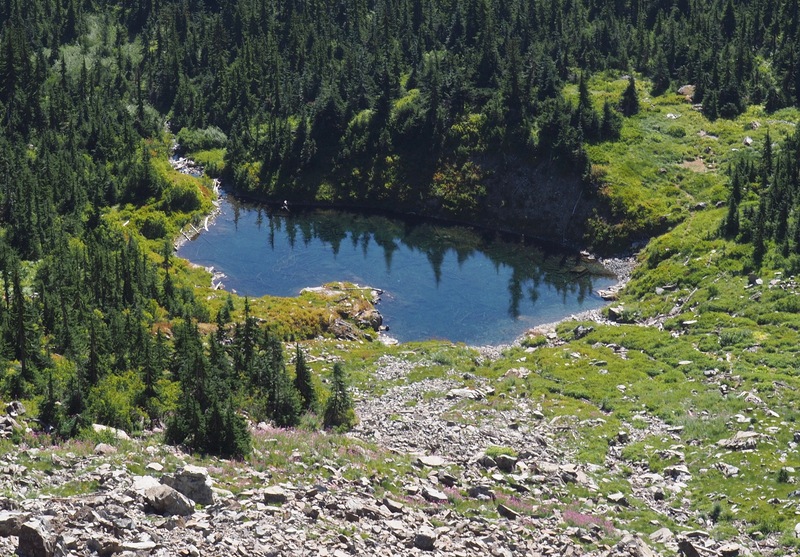 This page profiles the singular "Snow Lake" located in King County, Washington. The Enchantments' side-by-side "Snow Lakes" are located in Chelan County, farther north in the Alpine Lakes Wilderness. Snow Lake’s sapphire waters pool in a deeply set mountaintop basin. Snow Lake Trail, September 02, 2017. Aptly named, Snow Lake remains frozen and snow-bound well into summer each year — often as late as July. Nevertheless, its picturesque setting and relative ease of access render it the most popular hiking destination in the Alpine Lakes Wilderness during its brief summer. The rocky trail climbs moderately and then steeply up the ridge that forms the rim of the lake’s massive mountaintop basin before descending nearly as sharply to the lakeshore. Along the way, the trail alternates between evergreen forest and the talus slopes that are the Alpental Valley’s many winter avalanche chutes — seventeen in all. Hikers and snowshoers are encouraged to avoid this trail when snow is present; during autumn, winter, and spring, be sure to check trip reports and avalanche forecasts to ensure that current conditions are safe. Although one should expect to share the trail with others, weekday afternoons and moody, overcast days can provide opportunity to enjoy the lake in solitude. At approximately 1.75 miles/2.80 km from the trailhead, the Source Lake Loop branches left from the main trail and provides a view of tiny Source Lake, the inconspicuous headwater of the South Fork Snoqualmie River. For most, the detour is but a brief respite from the final ascent to Snow Lake; however, the loop trail actually continues beyond Source Lake, providing not only an increasingly sweeping view of the Alpental Valley below but also an alternate route to the lip of Snow Lake’s basin, where it rejoins the main trail. Just beyond Source Lake, the loop trail requires a bit of scrambling where it crosses the steep slope of shifting scree that is one of the valley’s largest winter avalanche chutes, which discourages most hikers from continuing and results in a surprising bit of backcountry quietude away from the throngs teeming the main trail a short distance away. Balance, sturdy ankles, and, perhaps, trekking poles will help to traverse the slope and attain the ridge above, along with keen eyes for spotting the small cairns that mark the way. For those wishing to climb deeper into the wilderness, the main trail joins the rugged High Lakes Trail on the far side of Snow Lake, which continues on to Gem Lake and the Wildcat lakes. The trail begins at the foot of Guye Peak, shown here from approximately 2.00 miles/3.20 km up the trail, and alternates between conifer woodland and open boulderfields that provide occasional glimpses up and down the Alpental Valley. Snow Lake Trail, August 30, 2010. The many boulderfields strewn down the mountainside along the trail are the valley’s wintertime avalanche chutes. From their treeless swaths, the surrounding peaks become increasingly visible, dominated by Bryant Peak (left) and Chair Peak (right) at the valley’s far end. Snow Lake lies below the far side of Chair Peak. Snow Lake Trail, September 02, 2017. The trail becomes increasingly stony as it climbs. Hikers may find supportive footwear and trekking poles useful. 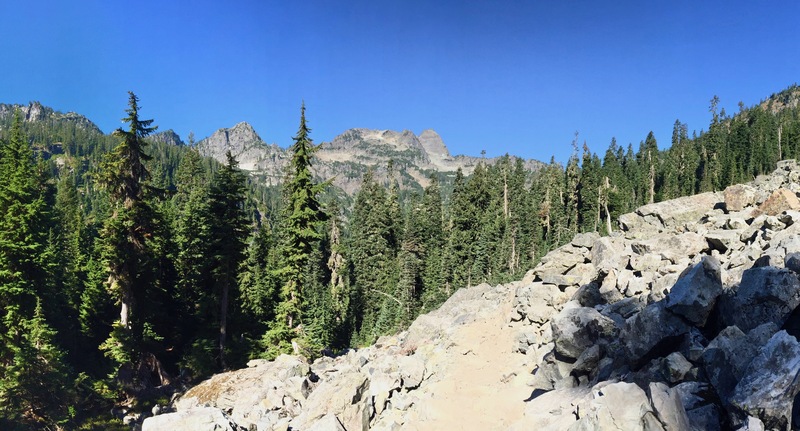 Snow Lake Trail, August 17, 2014. The Source Lake Loop branches from the Snow Lake Trail approximately 1.75 miles/2.80 km from the trailhead and arcs up the ridge above the lake, rejoining the main trail on the rim of the lake basin approximately 2.40 miles/3.90 km from the trailhead. The loop trail affords a closer view of the row of peaks lining Alpental Valley; here, from left to right, Denny Mountain (the leftmost two peaks), The Tooth, Hemlock Peak, and Bryant Peak. Source Lake Loop, Snow Lake Trail, September 02, 2017. Throughout much of its distance, the loop trail provides sweeping views down the Alpental Valley. Source Lake Loop, Snow Lake Trail, August 17, 2014. The Source Lake Loop takes its name from the rather inconspicuous lake it passes a short distance from its lower junction with the main trail. However, as its name implies, the pond-like lake is the headwater of the South Fork Snoqualmie River. In spite of signage and trail descriptions referencing the “Source Lake Overlook,” there is no specific “overlook,” other than a section of trail from which the lake is in more or less direct view below. Source Lake Loop, Snow Lake Trail, September 02, 2017. As the loop trail passes Source Lake, it switchbacks up a steep talus slope and around several small waterfalls where it can be difficult to discern. Look for cairns built by other hikers to guide the way. Source Lake Loop, Snow Lake Trail, September 02, 2017. Upon reaching the saddle between Chair Peak and Snoqualmie Mountain, the loop trail levels as it ambles through patchy forest along the ridge. 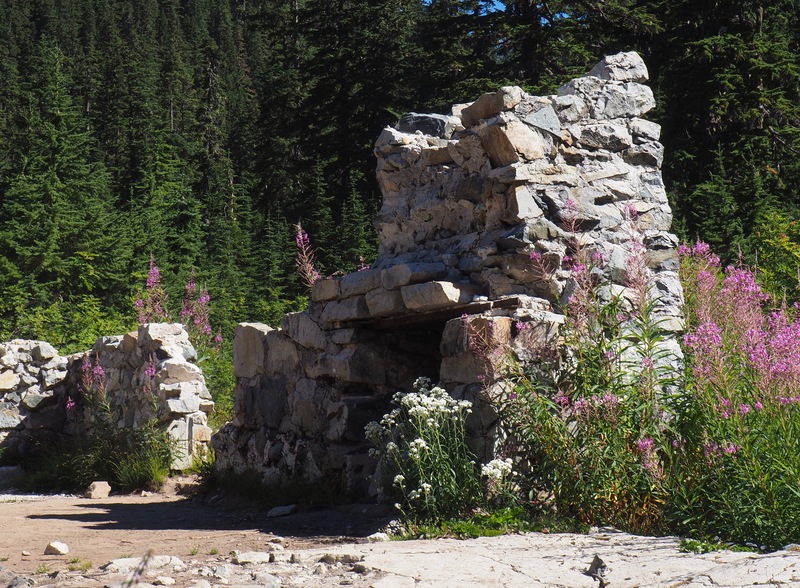 Source Lake Loop, Snow Lake Trail, August 17, 2014. Chair Peak towers high in the western view from the loop trail’s saddletop section. Source Lake Loop, Snow Lake Trail, August 17, 2014. Watered by snowmelt from the surrounding peaks, the ridge above Source Lake hosts an array of moisture loving wildflowers, including partridgefoots (Luetkea pectinata) (upper left); subalpine spirea (Spiraea splendens) (lower left); high mountain cinquefoils (Potentilla flabellifolia) (center); subalpine fleabane (Erigeron glacialis) (upper right); and mountain bog gentians (Gentiana calycosa) (lower right). Source Lake Loop, Snow Lake Trail, August 17, 2014 and September 02, 2017. Along the saddle, keep an eye out for a short boot path up to a ledge with a bird’s-eye view of Snow Lake far below. Source Lake Loop, Snow Lake Trail, September 02, 2017. The Source Lake Loop rejoins the main trail just below another rocky outcrop that provides the main trail’s first view of Snow Lake. From the overlook, the trail zigzags a half mile/0.80 km down to the lake and continues along its far shore. Snow Lake Trail, August 19, 2012. As the trail approaches the water’s edge, it passes the stone ruins of what was once a lakeside cabin. Snow Lake Trail, September 02, 2017. Chair Peak and its many-pointed neighbor, Mount Roosevelt, form Snow Lake’s rugged backdrop. Snow Lake Trail, September 02, 2017. 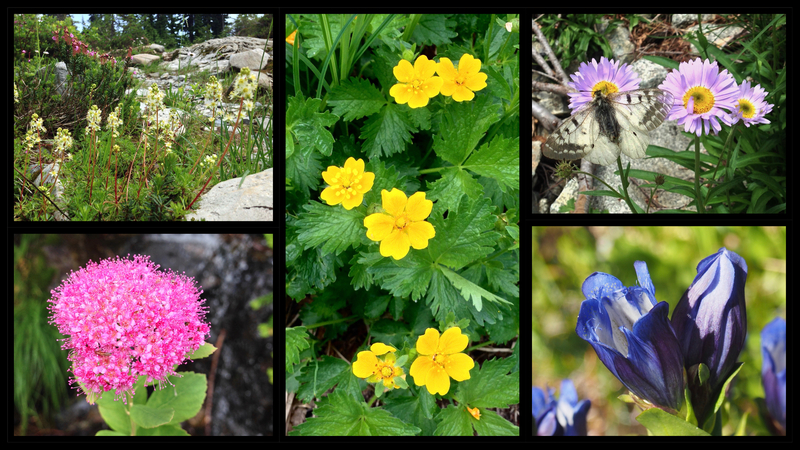 During the brief mountain summer, wildflowers accent the trail and lakeshore, including common beargrass (Xerophyllum tenax) (upper left); western pearly everlastings (Anaphalis margaritacea) (lower left); western columbines (Aquilegia formosa) (upper center); arnicas (Arnica sp.) (center); fireweed (Chamerion angustifolium) (lower center); and common harebells (Campanula rotundifolia) (right). 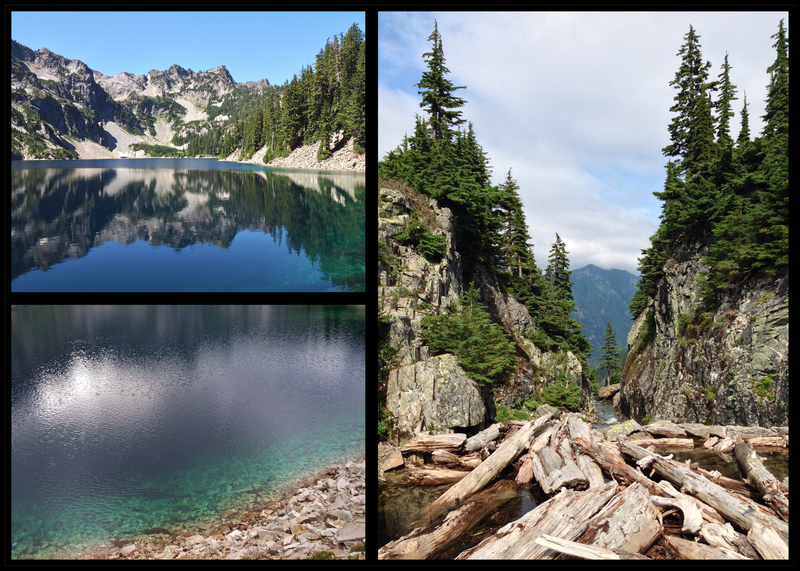 Snow Lake Trail, August and September, 2010, 2011, 2014, and 2017. The trail continues around the lake, where depth highlights its jewel-like hues and Mount Roosevelt reflects upon its glassy surface. In spite of its proximity to Source Lake and the South Fork Snoqualmie River, Snow Lake drains in the opposite direction through a log-jammed slot into the Middle Fork Snoqualmie River far below its northern rim. Just before the lake’s outlet, the Snow Lake Trail ends at a junction with the Rock Creek Trail and the High Lakes Trail to Gem and Wildcat lakes. Snow Lake Trail, August and September 2010, 2014, and 2017.